This article is about the picture of the Mummers shown below, comparing it with the probable source of its subject matter. 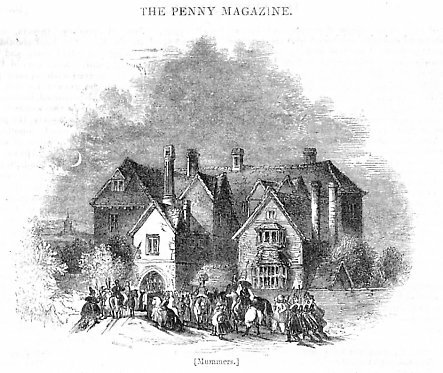 An engraving of mummers from The Penny Magazine, 1845. The picture shows a large group of people arriving at a manor house or mansion at night. The architecture looks Jacobean, Tudor, or even earlier. Let us look at the mummers in more detail, and, for reasons that will become apparent, enumerate what we can see. The scene depicts upwards of 35 people, some on horseback. At least one 'horse' in front of the doorway appears to be a hobby horse rather than a real horse. Some of the party are carrying flaming torches, and some carry pikes or spears. Of the people on horseback, one wears the unmistakable triple crown of a pope, one seems to be wearing armour with a resplendent plumed helmet, one wears a broad brimmed hat such as worn by cardinals, and another by the doorway wields an improbably long lance. Of those on foot, one near the centre may be wearing a mask, and one on the right is dressing in oriental style, with a turban and a dark face. At ye same tyme ye commons of London made great sporte and solemnity to ye yong prince. For vpon ye Monday next before ye Purification of our Lady at night , and in ye night, were 130 men disguizedly aparailed and well mounted on horsebacke to goe on mumming to ye said prince, riding from Newgate through Cheape, whear many people could see them, with great noyse of minstrelsye, trumpets, [blank], cornets, and shaumes, and a great plenty of waxe torches lighted. And in ye beginning they rid 48, after ye maner of esquiers, two and two togither, clothed in cotes and clokes of red say or sendall, and had their faces couered with vizards and handsomly made; after thes esquiers came 48 like knightes, well arayed after ye same maner; After ye knightes came one excellently arrayed and well mounted as he had bene an emperor; after him some 100 paces came one nobly arayed as a pope; after him came 24 arayed like cardinals; and after ye cardinals came 8 or 10 arayed and with black vizerdes like deuils nothing amiable, seeming like legates; riding through London and ouer London bridge toward Kenyton wher ye yong prince made his aboad with his mother. And ye Duke of Lancaster, ye earls of Cambridge, Hertford, Warwick, and Suffolck, and many other lordes were there with him to behould the solemnity. And when they were come before ye manour, they alighted on foot and entered into ye haule; an sone after ye prince with his mother and ye other lordes came out of ye chambers into ye haule, and ye said mummers saluted them, shewing a peyr of dice vpon a table to play with ye prince, which dice were subtilly made so that when ye prince shold cast he would winne. And ye said players and mummers set before ye prince three jewels each after other, ye first a balle of gould, then a cupp of gould, then a gould ring, ye which ye said prince wonne at thre castes, as before it was appointed; after yt they set before ye princes mother, ye duke of Lancaster, and ye other earles, euery one a gould ringe, and ye mother and the lordes wonne them; and then ye prince caused to bring ye wyne, and they dronck with great ioye, commanding ye minstrels to play; and ye trompets began to sound and other instruments to pipe, etc., and ye prince and ye lordes danced on ye one syde and ye mummers on ye other a great while. And then they dronck and tooke their leaue, and so departed toward London. Our illustration does not show as many people or horses as mentioned in the description, but this probably reflects the constraints of the medium and the picture size. Also, there are no obvious musical instruments. However, there are flaming torches, and the personages seem to tally, especially the pope. The engraving certainly seems to have been at least inspired by this account. As mentioned earlier, the picture bears very little resemblance to modern mummers. The name is the same, there may be disguises and seasonal house visiting, but there are far too many participants, and the characters are different. No drama is mentioned, the emphasis instead being on staging a processional spectacle. The dice playing mentioned in the second half of the description is also important. Dicing was a key and recurrent feature of courtly mumming and guising during the mediaeval and early Tudor period. We should not be surprised at these differences. Since 1377 we have had the major upheavals of the Reformation and the Civil Wars, and other significant social changes. Furthermore, all customs evolve, so one should be careful of making comparisons across a distance of over 600 years without investigating the custom during the intervening period. The extract above comes from the definitive transcription by Thompson (1874). Variant transcriptions have been published on innumerable occasions, most of which derive from Stow's Survay of London (1603), often through intermediary sources. The variations in the different renditions do not concern us here. They generally agree on the main points. This is the 2nd February, also known as Candlemas. This was regarded as the end of Christmas celebrations in pre-Reformation times.